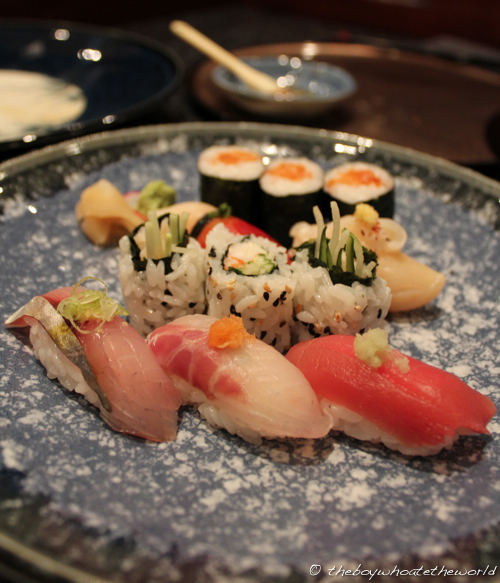 Great sushi is not easy to find in London. With outlets of Itsu and Wasabi on every other street corner flogging the same ol’ mass-produced Salmon Nigri, there’s little room left in the market for truly authentic sushi bars that are willing to serve top-grade fish at reasonable prices. However, if you look hard enough on a rather unremarkable street just north of Euston Square, what you will stumble upon is the teeniest tiniest of places where you will find a little slice of sushi perfection. Run single-handedly by one man behind the counter with his wife assisting with front of house, Sushi of Shiori looks more low-key takeaway outfit than premium sushi bar. But don’t let appearances fool you. Although it can only accommodate a total of 8 covers at most (3 at the bar, another 4-5 on 2 small side tables), what we experienced on our recent visit was some of the finest sushi in all of London. As soon you enter, you will be welcomed by the chef’s wife with such warmth you will feel like you are in their family home. I sometimes can grow tired when I’m sat at the sushi counter, having to watch a chef churn out dish after dish. Not this guy though. When you’re witnessing such focus, precision and tender loving care in the preparation of your sushi, it’s arguably almost as satisfying as the eating part itself. Given we only booked on the fly for the day itself, we missed out on their Omakase ‘chef’s selection’ menus which require at least 24 hours pre-notice. You pay for what you get on these and depending on how deep you’re willing to dig into your pockets (£40, £50 or £70), the higher the quality of the ingredients and grade of the sashimi the chef will serve you. Judging from how much neighbouring diners were enjoying their multi-course feast, we’re already plotting a return visit. So the A la Carte menu it was. We kicked off with one of their daily specials – a starter of fresh seabass slices and fish roe dressed in a light ponzu-flavoured vinaigrette. 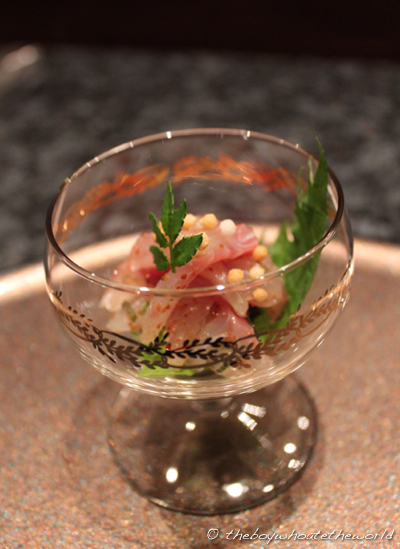 The sashimi was fresh and velvety… the rich flavour from the fish roe well balanced by the citrusy vinaigrette. What was particularly nice was the crunch from the little balls of rice crackers and minty shiso leaves. If I had one gripe, it would be size. They could have shown a little bit more love portion-wise. 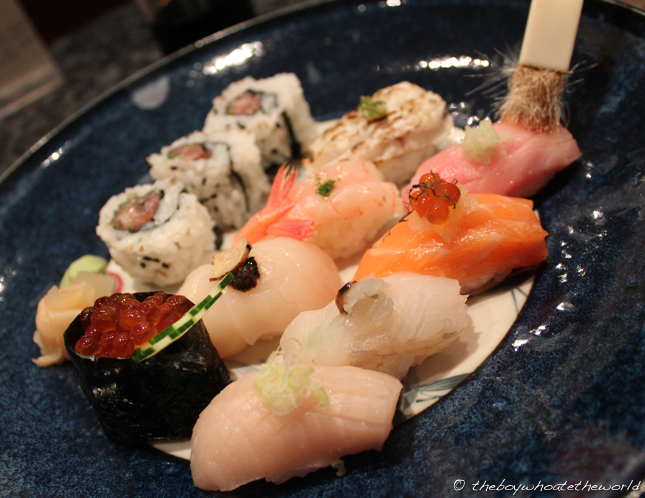 Then came their signature Shiori Plate – the Rolls-Royce of all sushi platters. And although the chef’s wife took the time to explain what every single item was, I was so busy staring at the intricate beauty of the perfectly formed nigiri in front of us that I frankly lost track after the first few explanations and felt a little embarrassed to make her repeat it all again. I’m sure I heard the words Chu Toro (fatty tuna), Hirame (turbot) and Crystal Bay Prawns amongst others. What I loved most was the painstaking attention to detail of the toppings… everything from fresh ginger to grated white radish to shavings of summer truffle. With sushi this good, dunking the rice side into soya sauce was clearly a crime. Instead, we were given a delicate pastry brush and instructed to paint the fish side of the nigiri with soya sauce to taste. Each mouthful was one that you wanted to savour forever. And can I just say, what a world of difference having just the right amount of soya sauce makes! 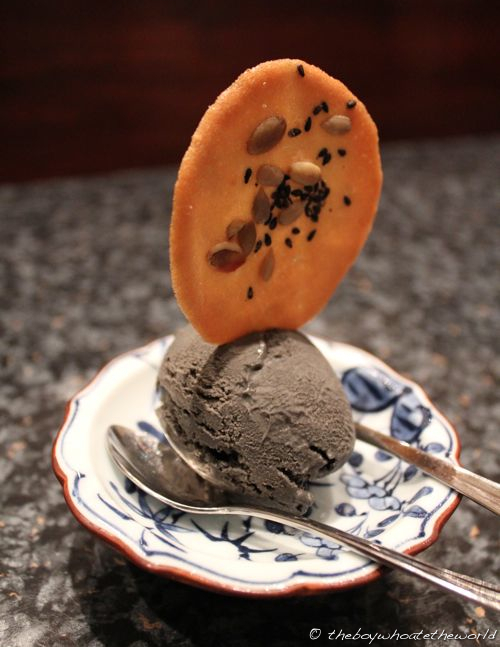 Their divine Black Sesame ice-cream, the colour the most uniform of slate-greys, brought proceedings to a happy end. The flavours were wonderfully balanced – just the right amount creaminess offset by savoury nuttiness from the black sesame. The pumpkin seed biscuit thin on top was a great touch. Sweet, crispy and light, it complemented the ice-cream beautifully. All in all, it was a fabulous end to a quite fantastic meal. Yes, dining here is a rather intimate affair and the modest venue isn’t exactly one that befits a special occasion. But for me, that’s the whole charm and draw of this place. What you’re getting is sushi of the very highest standard without the slightest bit of pretence…. so perfectly formed and made with such technical flair by a master sushi chef at the height of his powers. One thing’s for certain. We’ll definitely be back here to try their Omakase menu soon. @Janice: Yep, prime sushi is never cheap. But I don’t think it’s just London… Tokyo, NY… even sashimi in when I’m home in Malaysia is rather dear. Matt: Completely agree with you. Menu is so immensely understated it doesn’t do them any justice!!!! Did you pre-order the omakase or order from the Ala Carte? p.s. Very heartening to know you are a long time reader. Thanks for continuing to stop by and it’s great to hear from you! Shiori has moved to 45 Moscow Road since December 2012. Going to visit there in January. So Restaurant in Piccadilly does good Shime saba, havent really tried the other sushi dishes there. Compared to the quality and price at Midori Sushi in Tokyo　(http://www.sushinomidori.co.jp/index.html), nothing in London is competitive. Guan is right to say that prime sushi is never cheap. Its 15750+ jpy for places like Kyubey in Tokyo. Yes, I heard they moved to their new place in Bayswater! Aiming to try it soon in the new year as well.